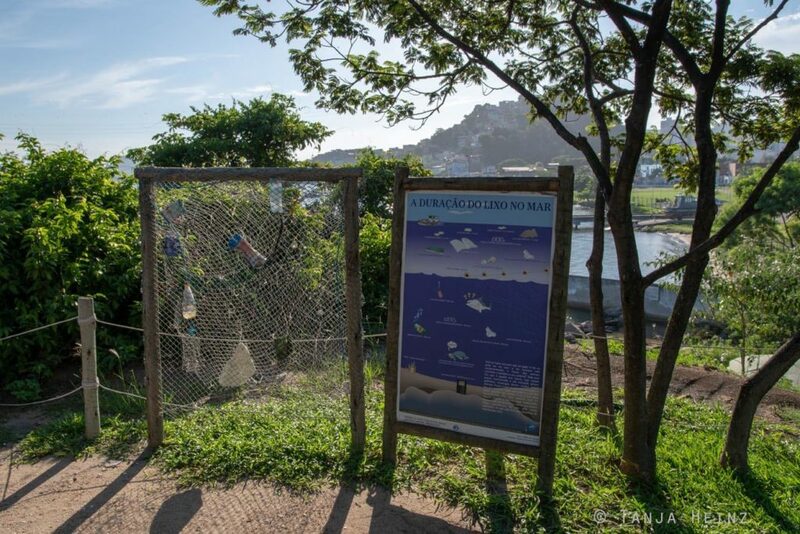 Like I mentioned in one of my previous articles, the Projeto TAMAR is a main contact point in Brazil with respect to the protection of marine turtles. 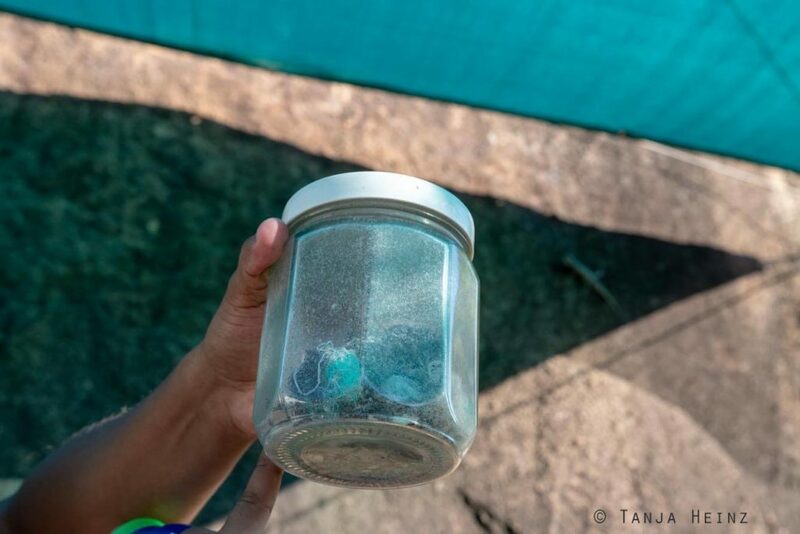 With more than 20 bases along the Brazilian coast from Almofala in the state Ceará in the North to Florianópolis in the state Santa Catarina in the South, the Projeto TAMAR informs and educates the public about all marine turtles that occur in Brazil to advance their protection. Because populations of all five in Brazil occurring marine turtles are endangered. 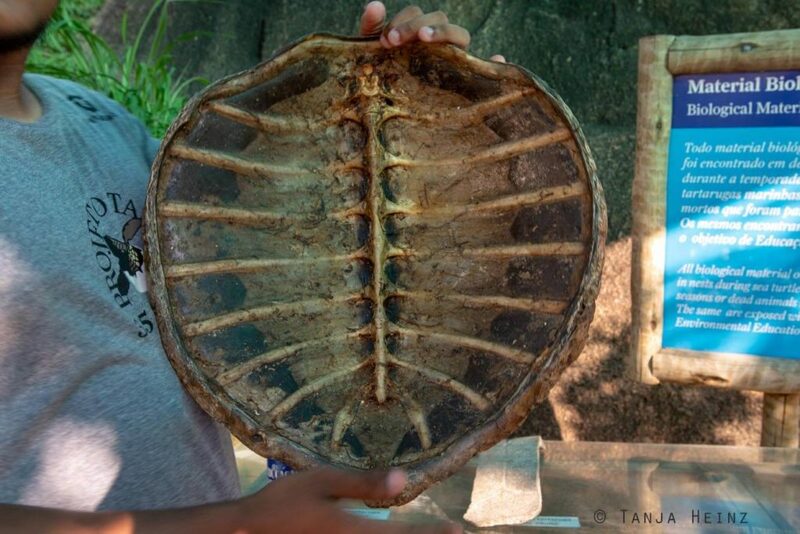 While olive ridley sea turtles (Lepidochelys olivacea), loggerhead turtles (Caretta caretta), and leatherback turtles (Dermochelys coriacea) are listed as “vulnerable” according to the IUCN, green sea turtles (Chelonia mydas) are in the category “endangered”. Hawksbill turtles (Eretmochelys imbricata) are even “critically endangered” according to the IUCN. 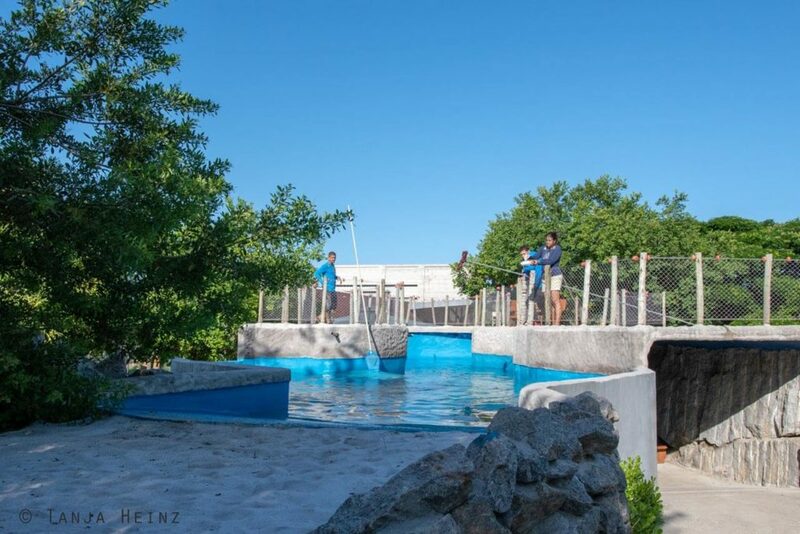 Before visiting the Projeto TAMAR in Vitória, I and my travel company visited the aquariums of the Projeto TAMAR Regência in the Reserva Biológica de Comboios close to Linhares. The two bases in Regência and Vitória were quite different. At the Projeto TAMAR Regência we did not meet any employees of the organization nor could we learn that much about the project. In Vitória, in contrast, we received much information about the Projeto TAMAR and their work. In the entrance area the first thing we encountered was the information about which five marine turtles occur in Brazil. In total five marine turtles live in Brazil. 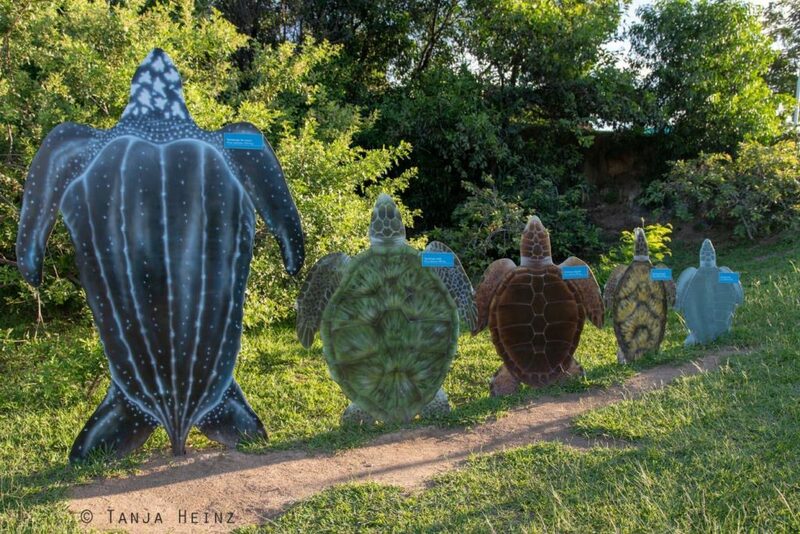 From large to small, in Brazil occur the leatherback turtle (Dermochelys coriacea), the green sea turtle (Chelonia mydas), the loggerhead turtle (Caretta caretta), the hawksbill turtle (Eretmochelys imbricata), and the olive ridley sea turtle (Lepidochelys olivacea). While the largest marine turtle – the leatherback turtles – can reach a length of up to 178 centimeters as an adult, the smallest of the marine turtles – the olive ridley sea turtles – reaches a length of only 72 centimeters. 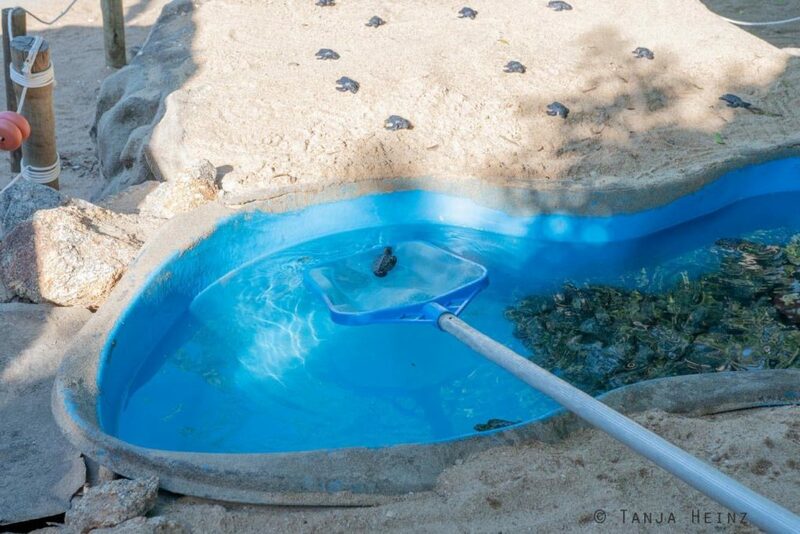 At the entrance area the Projeto TAMAR established a small pool demonstrating how marine turtle babies hatch and walk on the beach to reach the “sea” (in this case the pool). Of course the marine turtle babies outside of the pool were not real. However, in the pool there were real marine turtle babies. Because we had already been on the Morro da Penha to observe Geoffroy’s marmosets, we reached the Projeto TAMAR only in the late afternoon. 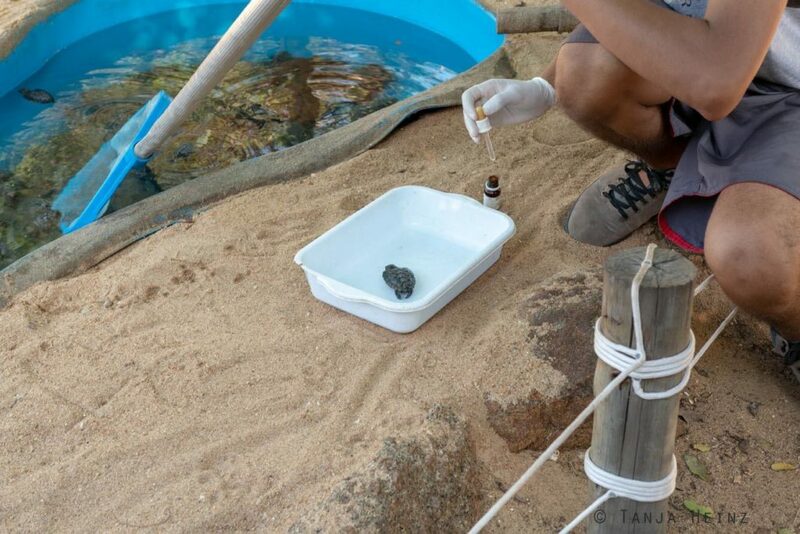 And exactly on this late afternoon employees of the Projeto TAMAR were giving medicine to the marine turtle babies. At first they had to fish the marine turtles out of the pool one by one. Only then they could give the medicine to each marine turtle baby. 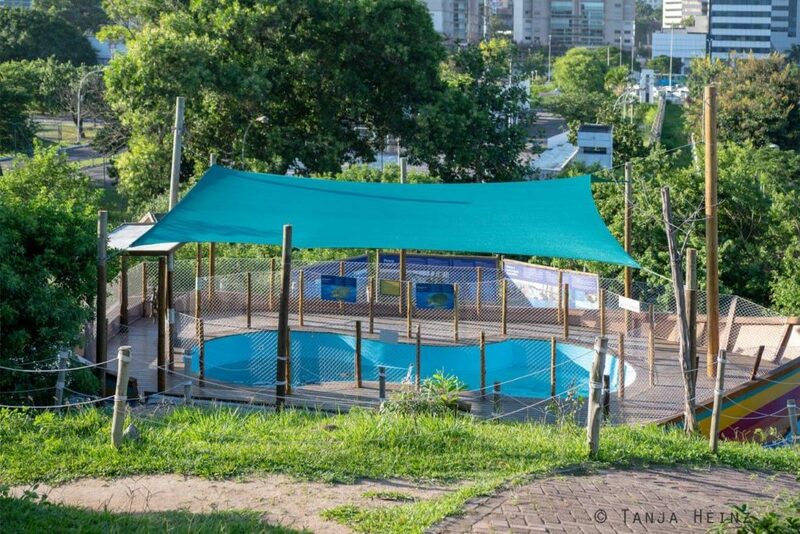 The Projeto TAMAR ist not a zoo primarily, but is highly engaged in the protection of marine turtles. 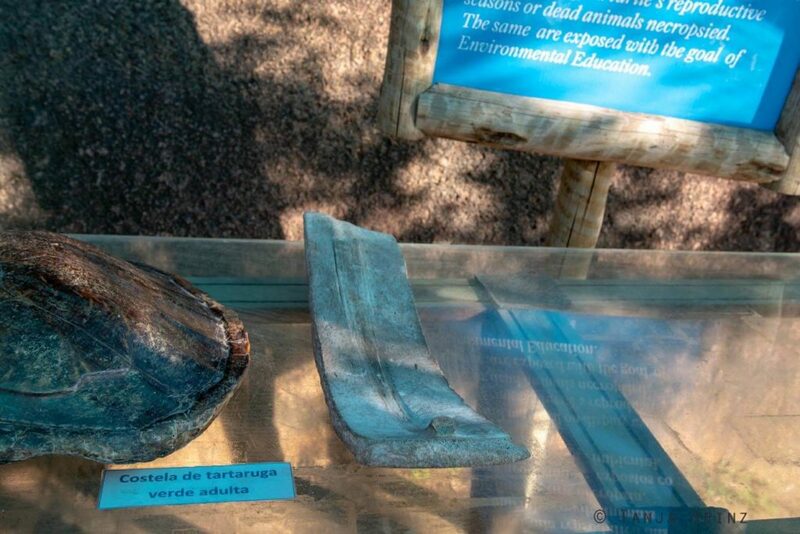 They do not collect marine turtles from the wild to present them in the visitor centers to the public. 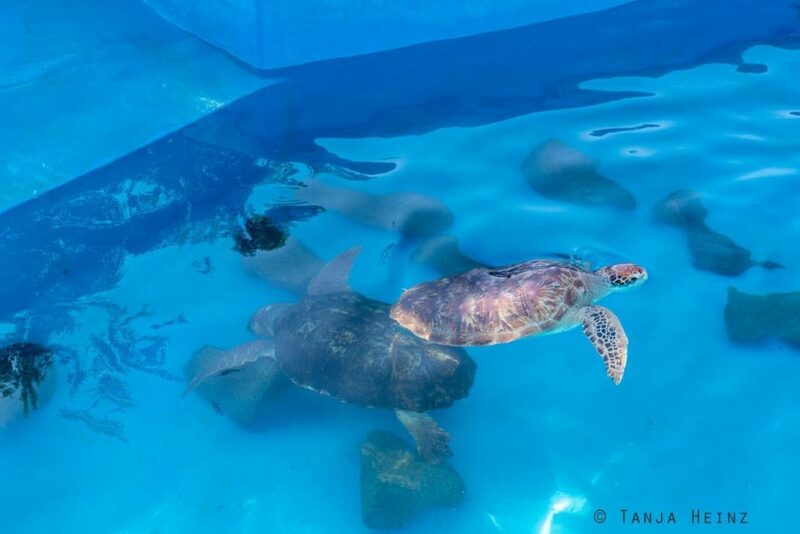 Marine turtles only remain in the pools of the Projeto TAMAR when they cannot be returned to the wild again. 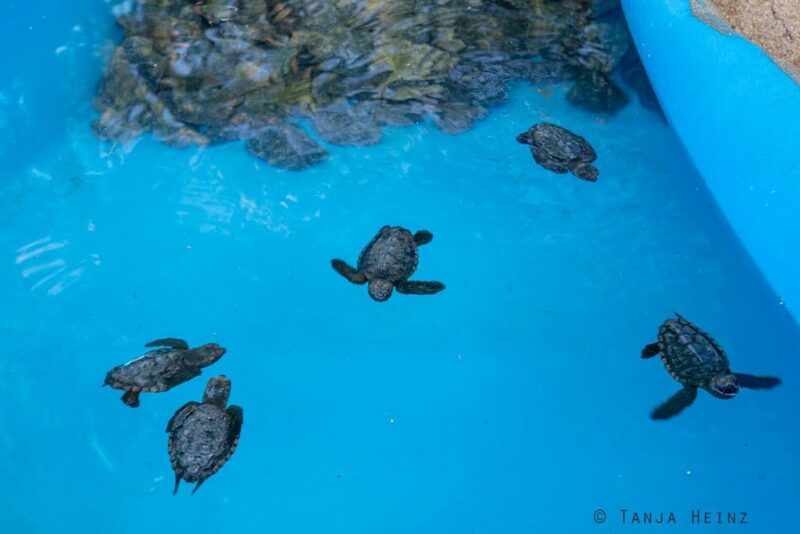 All marine turtle babies here in the pool will be returned to the wild if possible. It was especially interesting to hear that the Projeto TAMAR is involved in research activities. 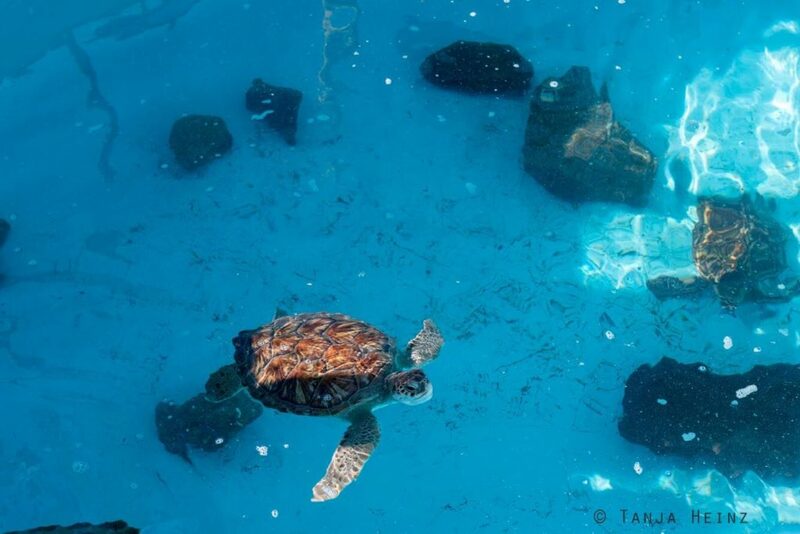 They use satellites on the back of marine turtles to learn more about their migration routes. In contrast to humans, naturally, marine turtles do not know national and geographic borders. That means, marine turtles that occur at Brazilian coasts visit other beaches in America, but also in Africa. Therefore, international cooperation is necessary to effectively protect marine turtles. For example, a leatherback turtle from Espírito Santo was already found in Namibia. And some of her conspecifics migrated from Gabon to Rio de Janeiro, São Paulo and Santa Catarina. In contrast, loggerhead sea turtles were found to travel from Espírito Santo up to the Azores. 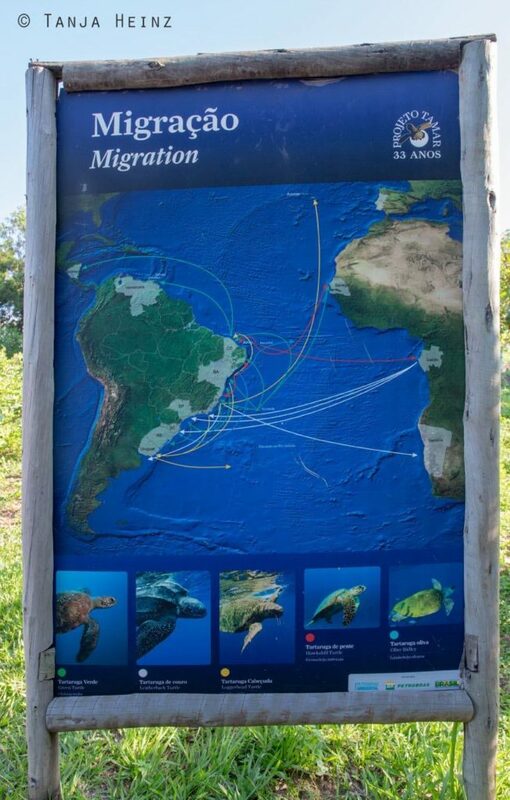 However, loggerhead turtles were also detected to move around within America like for example from Bahía or Rio de Janeiro to Uruguay or within Brazil from Bahía to Ceará. 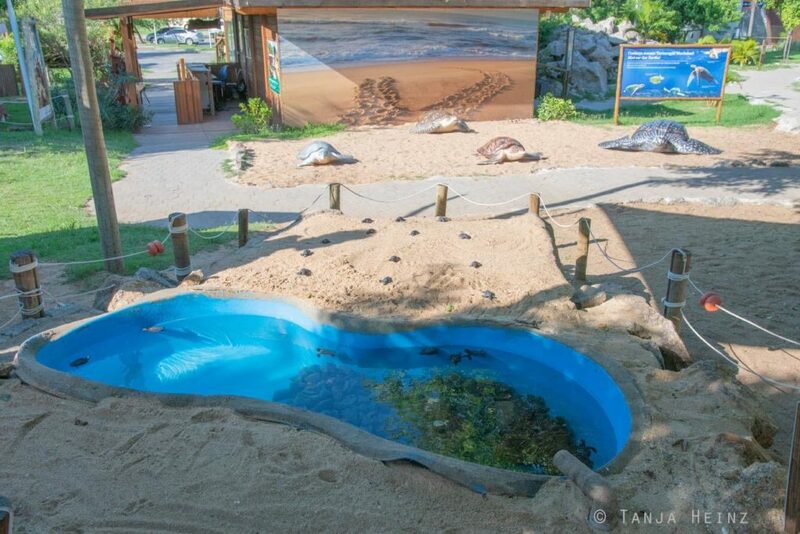 Nevertheless, following the entrance area one of the main pools with marine turtles in it cannot be overseen. 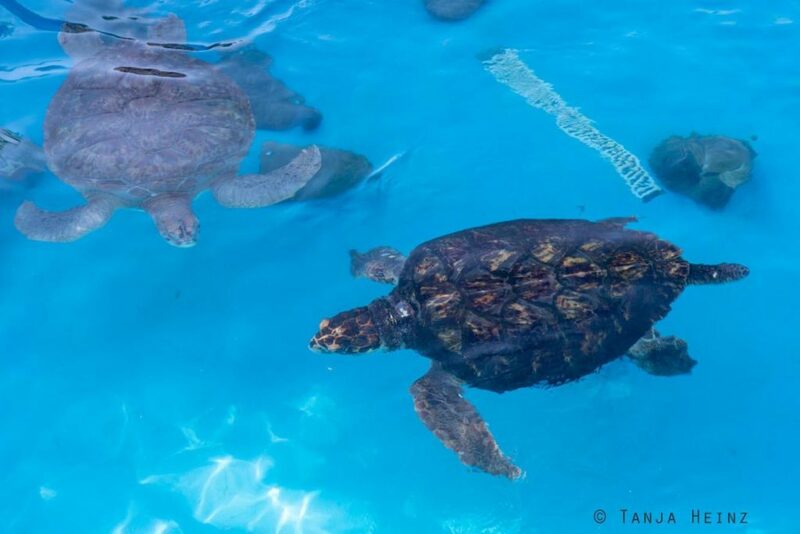 In these pools are marine turtles that cannot be returned to the wild again. On this late afternoon employees of the Projeto TAMAR were busy cleaning the marine turtles. In the first pool we saw marine turtles of different species in it. Within the main pool there were several sections in it. 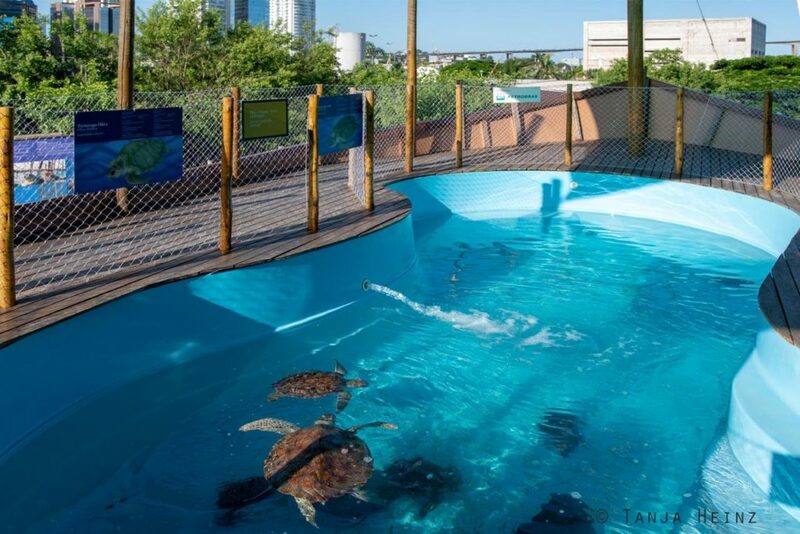 The marine turtles could change the sections within the pools. 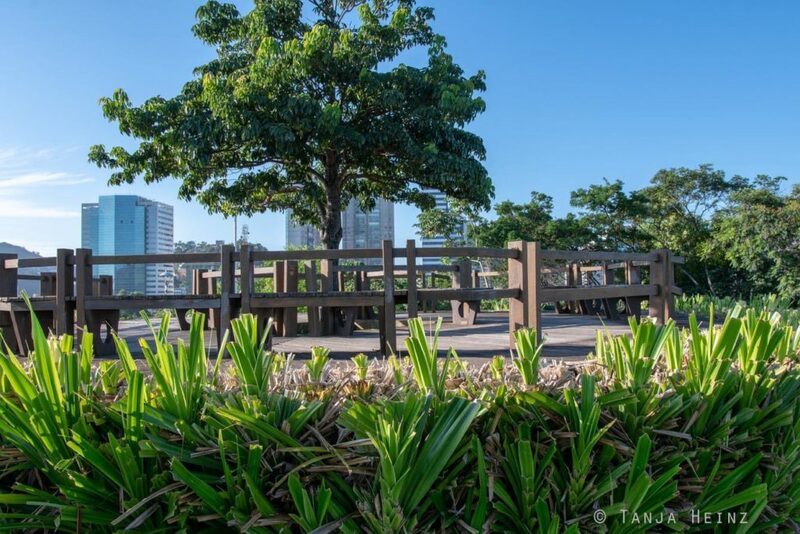 As there were only a few visitors at the Projeto TAMAR in Vitória on that late afternoon, one of the employees took time for us to show us around. After the main pool he showed us as well another pool with two more marine turtles in it. After that he took us to the area where we could see and touch some biological material of marine turtles. Like for example a half of a marine turtle shell. He also showed us some eggs of marine turtles. Did you know that a plastic cup survives 50 years in the ocean? A can which is made of aluminium even lasts up to 200 years in the ocean! And a nylon net up to 650 years! 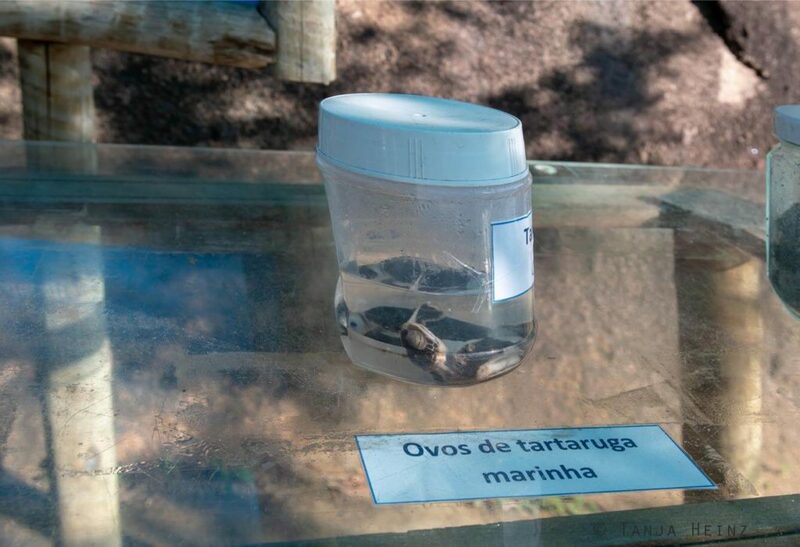 I also learned more about the life history of marine turtles at the Projeto TAMAR in Vitória. Marine turtles spend most of their life in the sea. Only females come to the beach after mating to lay eggs into holes in the sand. 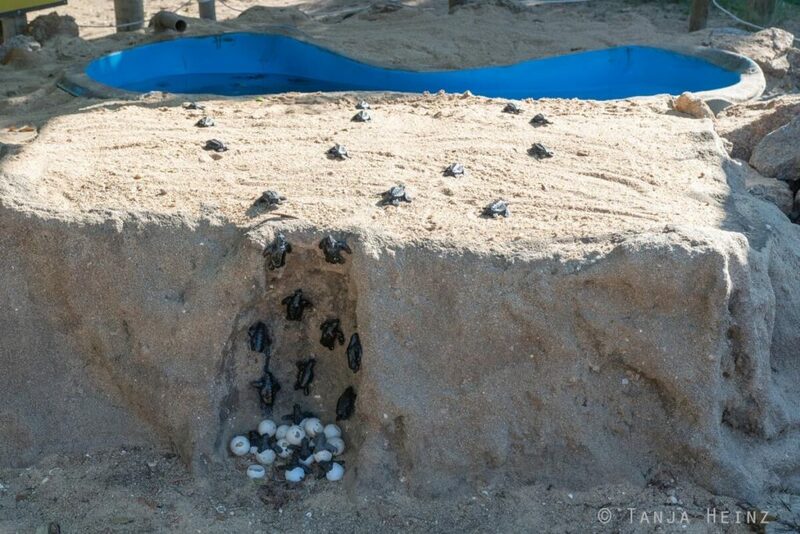 The incubation time of marine turtle eggs lie between 45 and 60 days. Afterwards the hatching little marine turtles have to cross the beach to the water of the sea. When they have reached the water, they spend the first few years of their life in the open ocean. Marine turtles rely on their habitat ocean. Therefore, they need an ocean without trash in order not to confuse trash with real food (compare a swimming plastic bag with a jellyfish). Which threats are marine turtles exposed to? Marine turtles are exposed to several threats caused by humans. However, they also have several natural predators like for example foxes or crustaceans. Marine turtles are most vulnerable after hatching. Sea birds, the octopus or several fishes are one of the main predators for young marine turtles. As adults marine turtles are relatively resistant against their natural predators. They might be attacked sometimes by sharks or orcas. But adult marine turtles are most vulnerable when they are females and nest at the beach. Humans are responsible for marine pollution. Mineral oil, plastic trash and waste water produced by humans pollute the habitat of marine turtles. Marine turtles and other marine animals do not only have to live in a polluted environment, but they also might confuse trash for real food. 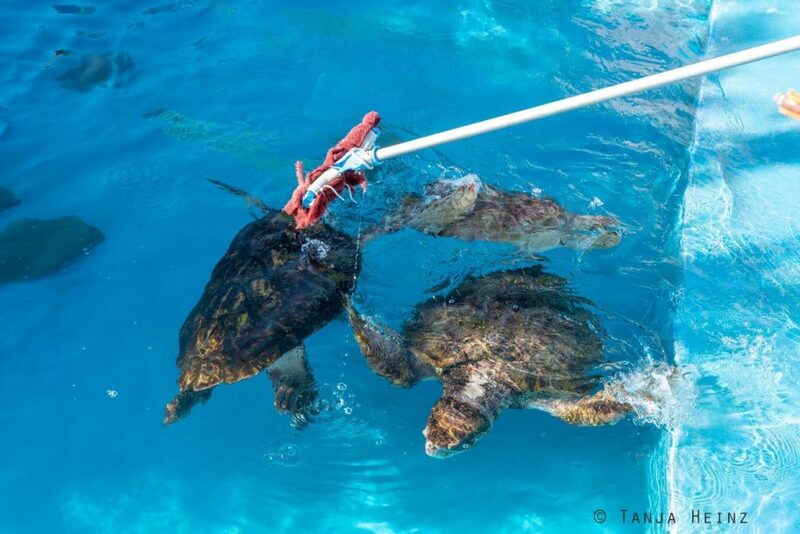 Marine turtles also might drown when they entangle in fishing nets. 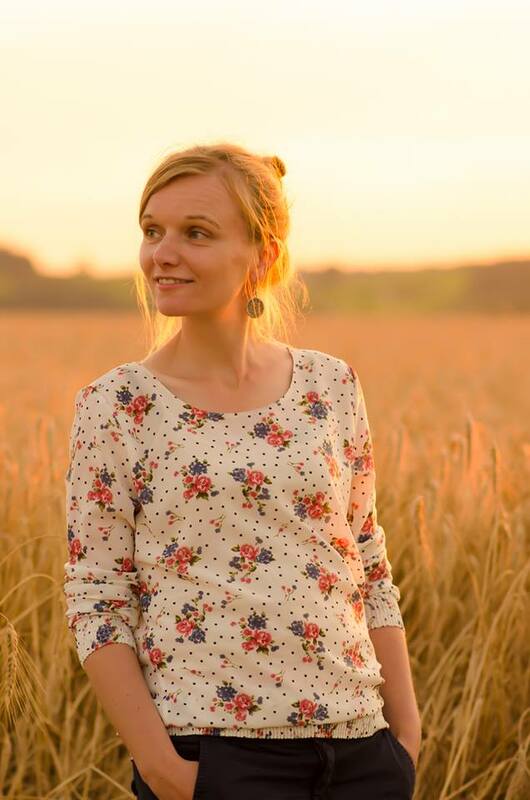 In some regions people hunt them for their meat and eggs are collected for consumption. Humans also take important habitat – the beach – of the marine turtles or they disturb them in the breeding season. For example marine turtle babies lose their orientation after hatching when beaches are artificially lighted or marine turtles die even before hatching when for example heavy vehicles on the beach destroy the nests. Furhtermore, buildings or climate change might cause temperature changes in their habitat. 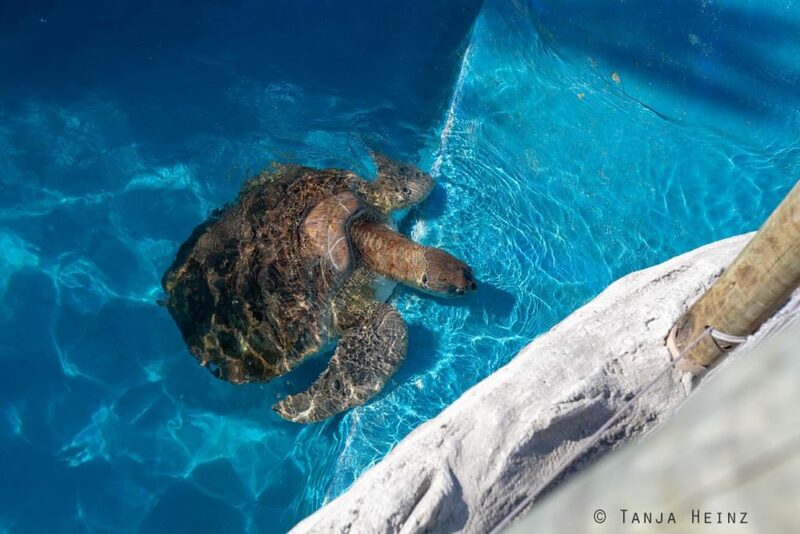 The right temperature is very crucial for marine turtle’s development. At low temperatures eggs develop into male marine turtles. At high temperatures, in contrast, eggs develop into female marine turtles. 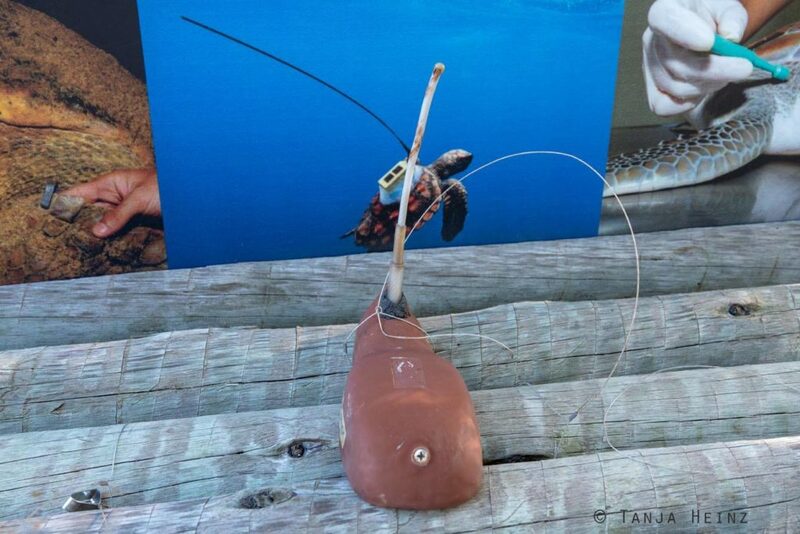 Therefore, projects like the Projeto TAMAR are necessary that do not only inform and educate the public, but also actively works against these threats marine turtles encounter in their environment. 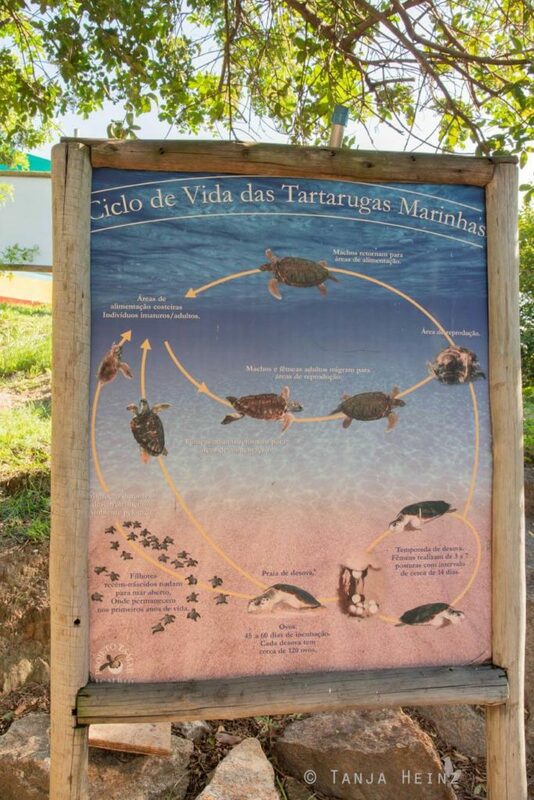 As early as the foundation of the Projeto TAMAR, the organization was involved in research activities in order to expand knowledge about marine turtles. Important information for their effective protection is, for example, their migration routes, but also their life history. If there is more knowledge about marine turtles, naturally, it is easier to protect them more effectively. The Projeto TAMAR also works together with fishermen in order to prevent marine turtles from entangling and drowning in fishing nets. Another important and central task of the Projeto TAMAR is education. For example via their visitor centers like the one in Vitória. 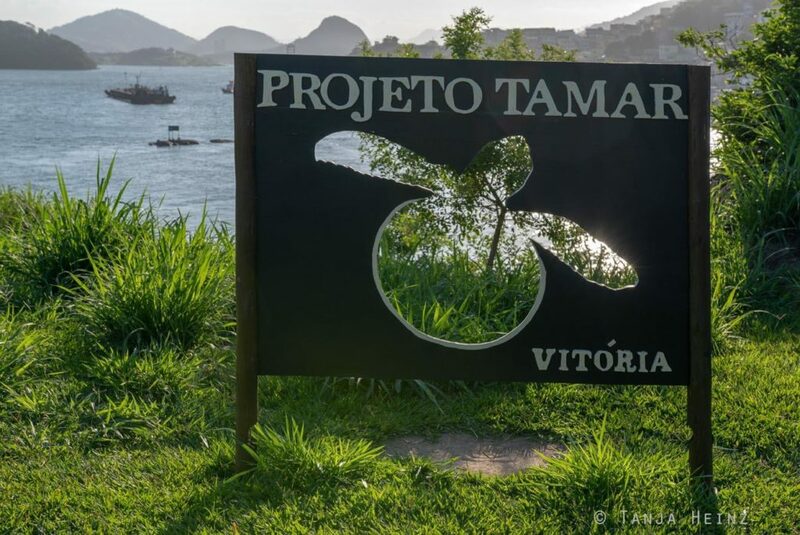 In total I visited three visitor centers of the Projeto TAMAR. 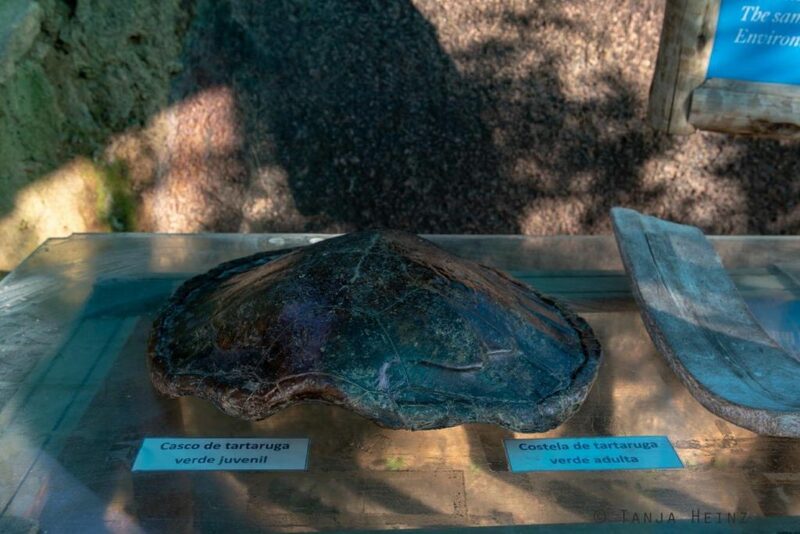 That is the one in Ubatuba in São Paulo and one day before the one close to Regência in the Reserva Biológica de Comboios – as well in the state Espírito Santo. There are more visitor centers in Brazil. That is in Fernando de Noronha in Pernambuco, Oceanário de Aracaju in Sergipe, Praia do Forte and Arembepe in Bahía and Florianópolis in Santa Catarina. 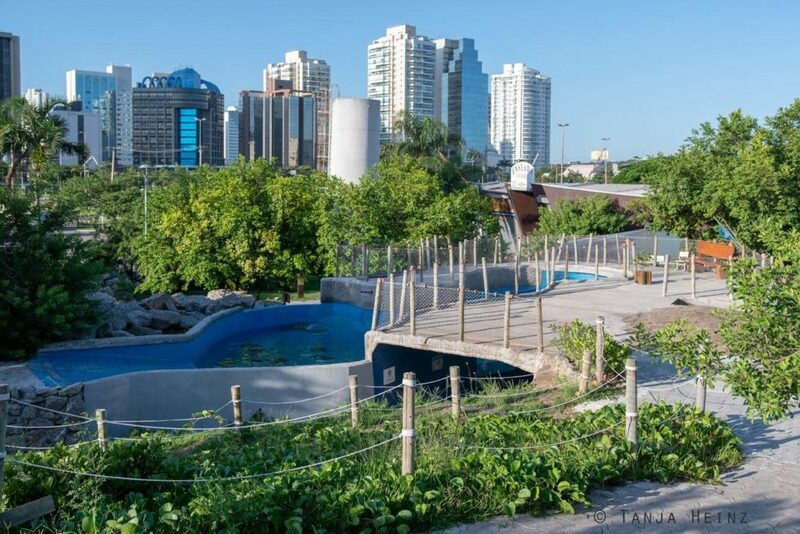 After our visit of the Projeto TAMAR Regência in the Reserva Biológica de Comboios, which is characterized by endless beaches, I could hardly imagine a base of the organization in the middle of a big city like Vitória. However, there is one big advantage of a base in the middle of a big city like Vitória: Visitors. In the Reserva Biológica de Comboios we were the only visitors and we needed about one hour to get to the reserve. In a big city it is much easier to spread the mission of the Projeto TAMAR. Although in the middle of a big city, there are some green oases that can be found. I’m very impressed by the work of the Projeto TAMAR. 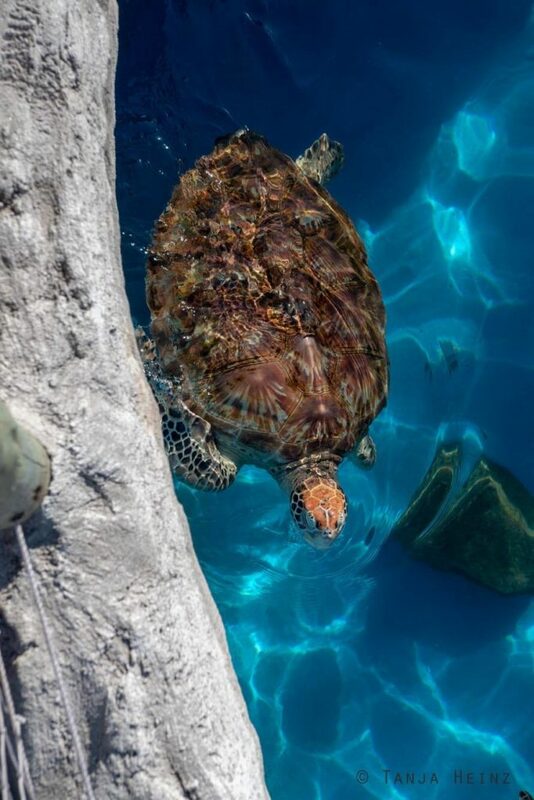 Although it is not possible to see marine turtles in their natural environment at the visitor center, the organization offers much information about marine turtles. Furthermore, every entrance fee contributes to the work of the Projeto TAMAR. In my opinion very worthy of support! Please check my article about the Geoffroy’s marmosets on the Morro da Penha for more information about arrival and accommodation in Vitória. 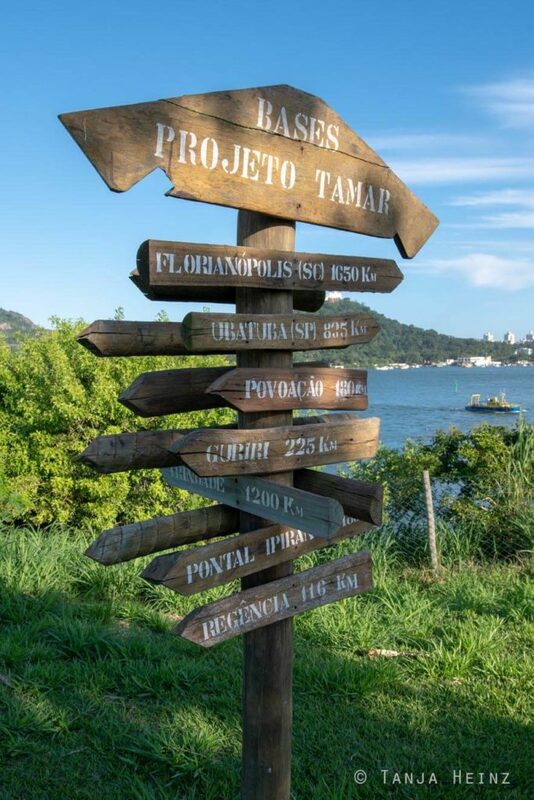 To visit the Projeto TAMAR by public transport, check the bus lines 211, 212 and 031.